Monday September 20th, 2010 Trisha Rhoads, Laurie Piccone and Amanda Dunkelberger attended an instructional class with D.J. 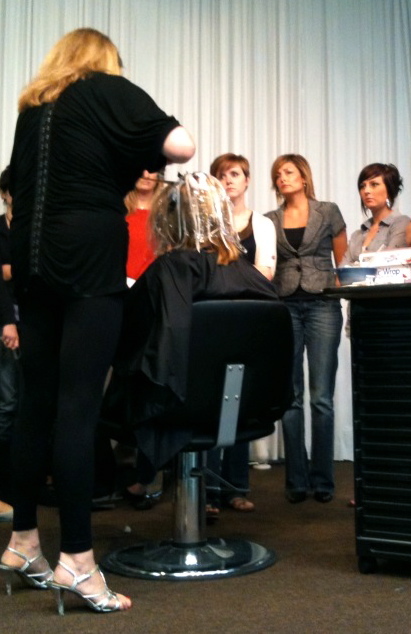 Mc Kinley, salon owner and L’Oreal Professional educator on proper technique for Balayage highlighting. The technique is popular with many celebrities such as Jennifer Aniston, Jessiac Biel and many of the models you see in retail clothing ads. The service provides sun-kissed natural highlights and individual tailored results. It also allows the stylist to deliver multi-color and plenty of dimension in the look. Another advantage of Balayage highlighting is the graceful way in which the color naturally grows out from the scalp versus traditional foiling.